Place oil and mushrooms in a hot pan cook until golden. Add herbs garlic and shallots. Cook until shallots become translucent. Deglaze pan with sherry and add cream. Let reduce until thickened. 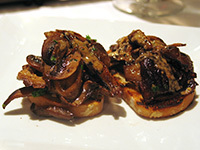 Serve on plates two rounds topped with mushrooms.